To discover and share knowledge about plants and their environment in order to preserve and enrich life. 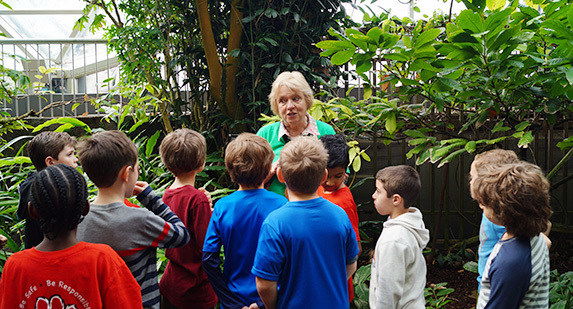 The Missouri Botanical Garden's School Programs team supports this mission by creating learning opportunities for school groups that are designed to inspire discovery, appreciation and understanding of the connections between people, plants and the environment. These opportunities make use of experiential learning and inquiry-based design principles, outdoor learning experiences and real-world applications. Team-style facilitation of Garden Class field trip experiences. Leading Guided Tours for visiting school groups. Facilitating cart-based interpretation for school groups. Assisting with other onsite events as needed. Completion of 24 hours of training to become familiar with all current programming. 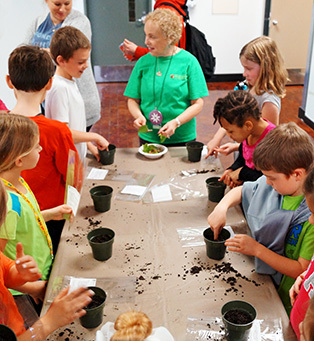 Participation in one morning per week (typically 9 a.m.–12:30 p.m.) of School Programs programming at the Missouri Botanical Garden during the months of September through December and February through May to facilitate programming for visiting school groups. Submission of outside hours biannually for submission to the Missouri Botanical Garden Volunteer Coordinator. Participation in monthly meetings and professional development opportunities as they are able. June–July Summers off—Camp work optional for those who wish to help! Submit an application to participate. Learn more about volunteer opportunities at the Missouri Botanical Garden on our Volunteer page. Contact the Education Volunteer Coordinator, Andrea Harper, at (314) 577-0259 or e-mail schoolprograms@mobot.org.